Damir Šodan was born in 1964 in Split. He earned his degree in English Language and History From the University of Zagreb. Šodan is a poet, a translator and a playwright. 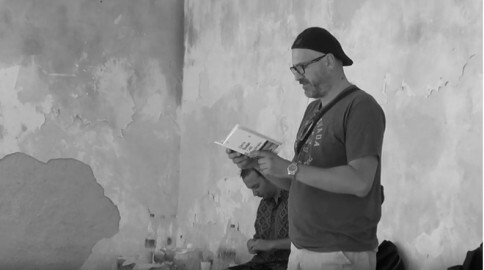 He’s written four collections of poetry: Glasovne promjene (1996) (Sound Changes), Srednji svijet (2001) (Middle World), Pisma divljem Skitu (2009) (Letters to a Wild Scythian) and Café Apollinaire (2013). Šodan has also authored several books of plays and many individual plays. He’s translated many notable American authors and poets into Croatian including Charles Bukowski and Raymond Carver. He works as a translator for the UN International Criminal Tribunal for the Former Yugoslavia in the Hauge, the Netherlands where he lives. Read ten poems from Damir Šodan in the link below.